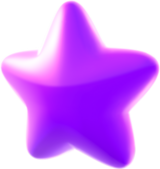 A small, purple, evil variant of the Mini Star. Causes the player to lose Mini Stars upon contact. Mini Ztars are small, dark purple miniature Ztars that were introduced in Mario Party 9. Mini Ztars serve as the opposing counterpart to Mini Stars, as they will cause the player to lose as many Mini Stars as the amount of Mini Ztars collected. As Mini Ztars are found in groups around the boards around certain spaces, they immediately display their effects if the player runs into them while assuming the role of the captain. Mini Ztars are rarely found alone, and are usually in groups of either three, five, or ten. Mini Ztars can also be obtained in the "Unlucky" pipes in an amount depending on the player's dice roll. Unlucky routes may also lead to the player collecting Mini Ztars. Mini Ztars are replaced by dark, purple bananas called Z-Bananas in DK's Jungle Ruins, though they have the same effect: they cause the player to lose Bananas when collected. They can be found as singular bananas or in bunches. Mini Ztars reappear in Mario Party: Island Tour, along with Mini Stars, and only appear in Star-Crossed Skyway. Mini Ztars have the same role as in Mario Party 9. Mini Ztars can be obtained at Star Stages by either Bony Beetless (two Mini Ztars), Bone Goombas (five Mini Ztars), or Dry Bones (seven Mini Ztars). If a player collects too many Mini Ztars, it has the danger of the player's total being negative. This is the only game in which a player can have a negative Mini Star total, as the other two games have a minimum cap of zero. If so, the number appears as red, except in the final results screen after a game and in the current standings screen in intermissions. Mini Ztars reappear in Mario Party 10 in Mario Party mode having the same role as in past Mario Party installments. This page was last edited on January 3, 2019, at 23:33.